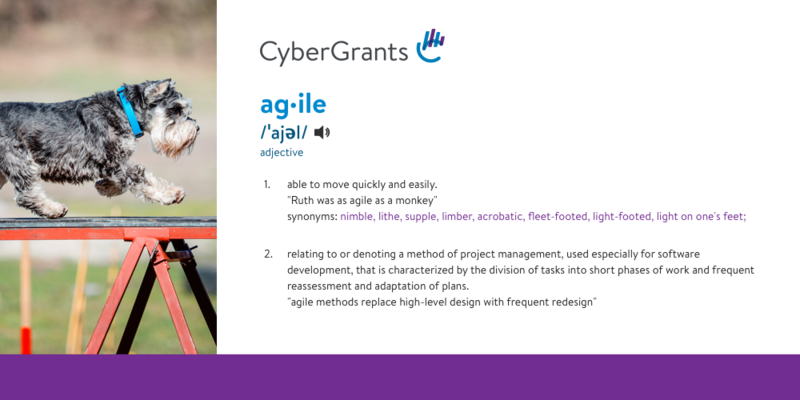 The true definition of agile is “able to move quickly and easily” and when it comes to project management, it’s often used to describe a method to developing software. So while agile software is the process in which it is built, the software itself can also work with agility to provide users with a better experience. Agile software is built to help teams deliver value to their users faster and with fewer roadblocks. Being an agile software means it’s developed and evaluated incrementally so the software can respond to changing needs more efficiently. The same concepts are applied to how the software operates so end users can respond to change quickly. What types of corporate philanthropy programs can you support with Agile CSR Software? Matching Gifts - Amplify employee engagement initiatives with matching gifts and promote causes that mean the most to your employees. Dollars for Doers - Offer monetary incentives to strengthen your CSR impact and boost employee engagement. Individual and Team Volunteerism - Measure and evaluate volunteering in your giving program with our intuitive features. Disaster Relief - Provide employees with the chance to assist those in need during unexpected catastrophic events that touch their hearts. Payroll Deduction - Give employees the chance to support what means the most to them with a payroll deduction. Event Management - Companies provide a listing of corporate volunteer opportunities for their employees. Events are searchable by date, location and interests. Volunteer hours are recorded and tracked for reporting purposes. Could you be using the wrong #CSR software for your industry or program lifecycle stage? Take a look at these aspects of an agile CSR system!Tweet This! Political Action Campaigns - Provide your employees a secure platform to pool resources and help their voices be heard on issues they care about most. Team Incentive Program - Corporate social responsibility programs where groups of employees volunteer together to earn money or other incentives according to the amount of time they serve. Charitable Spending Account - Similar to popular Health Budget Accounts, the Charitable Spending Account allows employees to set aside pretax dollars for donations. Employee Assistance - Show your employees that their company and coworkers have their backs. Employees can apply for financial support or employees can donate to the Employee Relief Fund. Tuition Reimbursement - Encourage your employees to continue their education with a tuition reimbursement program. Scholarship programs can also be made available for family members’ education expenses. Wellness Programs - Support your employees’ comprehensive wellness goals and reap the benefits of a healthier, happier workforce. Product/In Kind Giving - Help make an impact by donating needed goods and services to charitable organizations for their use (e.g. product, computers, software, airline miles, etc.). Medical Education Grants - Advance research, innovation and medical education to improve healthcare access and patient outcomes. CD Service Hours - Fulfill your CRA (Community Reinvestment Act) requirements and support your assigned assessment areas by encouraging your employees to engage in community service programs targeted to support low- and moderate income individuals or families. How does Agile CSR Software support employees to participate? One of the things many companies often overlook is selecting a system that works in the way their employees work. For example, employees in a healthcare facility like a hospital are going to respond better to a software that’s available via mobile app whereas a 9 to 5 organization with an office-like setting is going to be more attuned to the desktop version. If your team is working with a slow #CSR system, or one with technical issues, eventually employees will stop logging in to it altogether.Tweet This! Employees are able to make a bigger impact when employee participation is easy. Searching for volunteering opportunities or charities to donate to should be done in just a few clicks from whichever device they work on. If your team is working with a slow system, or one with lots of technical issues, eventually employees will stop logging in to it altogether. How many employees of those that signed up to volunteer actually completed the volunteering hours? What’s the breakdown of disaster relief dollars from each workforce segment and what employee pools should we be tapping into to increase donations? With Agile CSR Software, you can see these simple metrics and so much more! Agile CSR Software helps you manage the data by tracking, monitoring and reporting information back to admins and program managers to help them make more strategic decisions.